Ardent readers or Kit Kat fanatics will recall that Breanna wrote about the Japanese version of KitKat Caramel a year or so ago, and that it was her favorite out of several foreign KitKat varieties she tried. Well hold on to your kittens, ‘cuz a Kit Kat Caramel variety has now come to the USA. Breanna wrote that Japanese KitKat Caramel tastes more like butterscotch, and has tiger stripes. What about the domestic version? And why do so many people like Kit Kats, anyway? Well of course you know why people like Kit Kats. As Dr. Steve Brule on Tim and Eric Awesome Show Great Job! might say, “It’s the texture, dummy!” Indeed it is. Kit Kat’s crispy wafers mixed with chocolate have been a good combination since developed by Rowntree (of York, UK) in 1935. And who doesn’t like snapping off those nice little candy fingers? 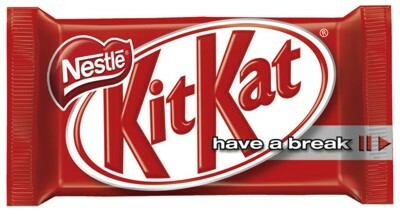 Well, you can forget that with the Kit Kat Caramel. And no, it doesn’t have tiger stripes, either. If you happened to have been sitting at your computer all day last Thursday, constantly refreshing our site (and I’m sure many of you do), you would have noticed something odd. 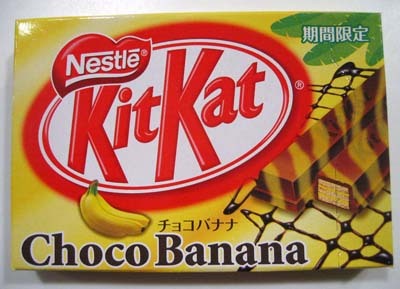 On Breanna’s Japanese KitKat review, the spelling of KitKat kept changing between Kit Kat and KitKat. What you couldn’t see was a feverish effort behind the scenes to research which way was actually correct. Unfortunately, it just isn’t a clear cut matter. You see, in the United States, Hershey obtained a special licensing agreement in 1969 which allows it to manufacture and distribute Kit Kats. According to the Hershey Kit Kat page, the proper form is, in fact, the split form of Kit Kat. However, Hershey’s arch competitor Nestle manufactures and distributes KitKat in pretty much the rest of the world. While their website isn’t terribly consistent, for the most part, and especially on their history of KitKat page, the one word form is used. After much discussion and wrangling, we finally decided to go with whichever form is used in the country in which the bar in question is produced – in the case of Japan, KitKat. It wasn’t easy, but we think we’ve finally come to a suitable compromise. Oh, the stress of a Candy Addict’s life! It’s too bad Andy didn’t check online. If he had, he would have easily discovered our list of the Top 10 Candy Jingles, with useful links to the commercials on YouTube. At least he’d know that the song doesn’t advertise a brand of cat food! UPDATE: Here’s a hilarious mashup of the real commercial and Andy. 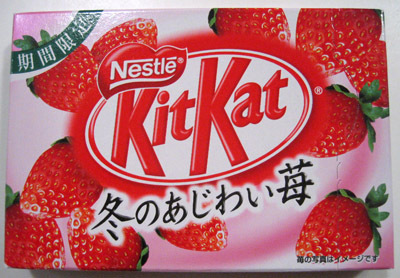 Winter in Japan is the strawberry limited edition candy time and KitKat is not one to be left out. Like last year, KitKat has come out with a special edition strawberry flavor. This year is unusual though, since it seems one is not enough. Two new strawberry flavored KitKats have been released: one that comes in a giant bag of Mini Strawberry fingers, and the other is a full bar called “Winter Strawberry”.